With Buffalo Fly season upon us, it is time we discuss effective fly prevention and treatment methods. If left untreated, these small yet serious pests can be detrimental to a cattle producer’s stock and result in significant economic loss. Buffalo Flies are small, external, blood sucking insects that irritate cattle, interrupt feeding and quite often result in skin lesions. Ideal conditions for Buffalo Fly infestations are when we have had a mild winter followed by a wet summer, thus the recent dry weather has fortunately meant low fly numbers so far. An integrated approach is the most effective strategy to control Buffalo Fly. 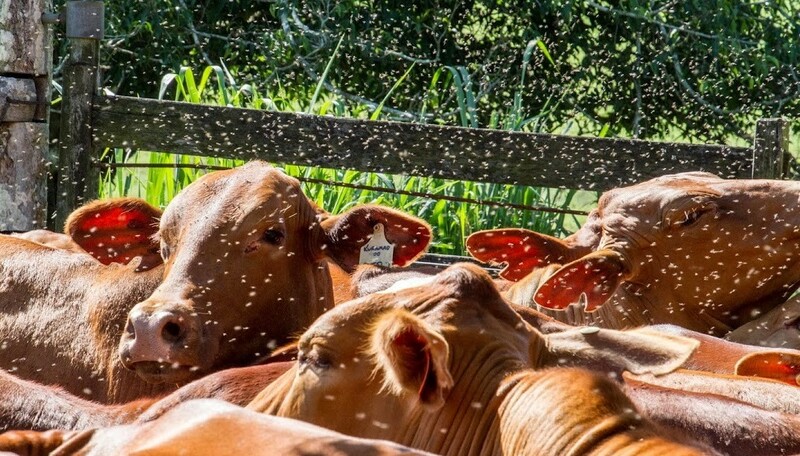 Wherever possible, non-chemical methods should be utilised first to control the infestation, however if fly numbers increase to over 200 flies per animal (beef cattle) or 30 flies per animal (dairy cow), chemical treatments can be used to provide effective relief for the cattle. Non-chemical methods include: fly traps, dung beetles and culling allergic cattle. Spray on - Coopers Diazinon (in limited supply this season), Nucidol or Barricade S. back rub. Back rub - Supona (no longer available) can be replaced by Nucidol or Cattle Coat (an organic back rub treatment). Pour on - Easy-Dose (in limited supply this season), Swat or Demize. Ear tags (still in supply at this stage, although if the northern regions experience a high fly burden this could change). There are very few chemicals available to control buffalo fly, therefore it is recommended to minimise chemical use, as it is possible for the flies to develop a resistance to the chemicals if used too frequently. The use of an early season spray or pour on treatment, followed by the application of ear tags for 4 months during peak fly season, will help to reduce the risk of resistance and the number of times the cattle need to be handled. Remember to remove the tags promptly so that the flies are not exposed to a less than lethal dose, which may lead to resistance developing. It is also advised that you discuss and coordinate your treatment plan with neighbouring cattle producers and that you alternate the type of chemicals used. If you would like some help to establish an ongoing treatment plan for your cattle, please do not hesitate to contact myself via jess@dalbyruralsupplies.com.au, call our Merchandise Team on (07) 4660 0400 or pop in and see us in store.